When I was pregnant with my first child, and as a newish mother of young children, the aisles of Target (TGT) were my tonic, antidote for withdrawal from my designer label shopping addiction. I would wander the store, always marveling at the number of other pregnant women and parents with small kids, whiling away the hours through consumption. Have credit card and full SUV tank, will spend an idle $200 at Target. But now? Target is my cautionary tale. I advise other parents looking to reduce their spending and re-think the concept of "disposable income" to avoid Target and Costco. Those $5 seasonal t-shirts and array of cute candles and fashionable lampshades are the enemies of frugality. Today, I stick to the food co-op and farmer's market for my groceries, hopeful I'll avoid the temptation to buy all that extra "stuff" by shopping only where the necessities are. 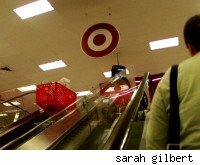 It looks like I'm not alone in my changing shopping habits, as Target's same-store sales fell 2.9 percent last year. The solution to the drop? Fresh food, to reel in people like me who do, after all, still need to eat. According to Target CEO Gregg Steinhafel, the best way to beat a recession is to give people strapped for cash the one thing they're always buying, no matter what (and hopefully they'll pick up that $5 tee because, after all, it reminds them of their flush days). "That's the power of this. This concept is not cyclical," he says. A new slogan proclaims, "Eat Well. Pay Less," (a nod to "Expect More. Pay Less," says The Wall Street Journal, although I wonder if it isn't also a nod to Michael Pollan's famous "Eat food. Not too much. Mostly plants," which advises readers to, among other things, eat fresh produce instead of packaged convenience food.) To speed up checkout, produce is separately packaged and bar-coded; as the WSJ mentions, "even individual potatoes come wrapped in plastic." The WSJ piece goes on to make the obvious analysis: Target faces the problem of becoming so much like Walmart Stores Inc. (WMT) that it's indistinguishable (the opposite accusation is also being made, so it's clear this is already an almost-insurmountable risk); its trendy clothing and home departments are being threatened by unusually savvy competition from JCPenney Co. (JCP) and Kohl's Corp. (KSS); the grocery business is low margin and it's hardly the place to find refuge in a time of falling profits. These dangers are all real and will likely keep the success of the fresh food strategy modest. But here's another thing: this strategy, unfortunately, misses the mark entirely for the customers who have stopped shopping because of a growing concern over their wasteful consumption habits. We look at Target the way a recovering alcoholic looks at a favorite pub; with fondness, but also, a little horror. Do you remember the way we were when we'd wake up in a pile of our own plastic bags? we'll say to ourselves, shivering at the thought. And when our idea of a good time was to buy enormous plastic seasonal toys, knowing they'd be in the trash pile by the end of the summer? Consumers who have turned away from Target as a temple to over-packaged, heedless consumption will not come back for (seriously?) carrots and heads of lettuce individually wrapped in plastic. Are the bananas individually wrapped, too? No, don't answer that, it's going to have me breaking out in cold sweats. This strategy is temporary at best, a half-considered concept that needs a serious overhaul before it will save the store. And please, Target, think before you add even more plastic to our materials economy.